Enables you to place orders, directly on the chart, with a single click! 🙂 Much, much faster and easier than charttrader (IMO). Much, much easier than right click chart, find menu option, select sell limit, move order to right place on chart, etc. A second can be a long time when scalping! The best way to demonstrate this is with a picture, so here it is. The panel down the right of the screen enables me to easily change automatic profit targets and stops, if desired. 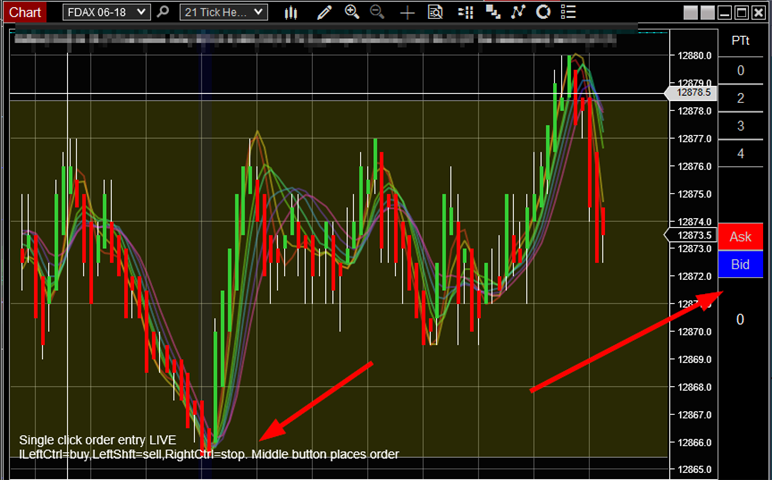 Simple mouse click on chart at the desired price level to execute. Ctrl and middle click to buy, Shft and middle click to sell. Right ctrl middle click for stop orders. All are limit, so just click above/below for equivalent of market order. You can then manage the individual orders just like normal. I experimented for some days to find a comfortable and convenient keyboard combination, and this seems to work well. There’s a buy bid and sell ask button too, as I use those a lot. The sidebar is very narrow and takes up ~10% the width of chart trader, so you don’t have all that wasted screen space. The 0 is the current position. It updates as your orders are filled. I achieved this in an indicator. Something Ninjatrader originally told me could not be done. pjsBuySellButtons is written as a strategy to overcome that issue. It had some drawbacks though, such as orders on the same instrument from charttrader or dom killing of the strategy (as is intended by NT, by design). This works much better, though it took a bit of work to get right.